Are We Safe at RHS? Where Are They Going? The Class of 2016, that is! Mr. and Mrs. Claus 2015! Where will the Class of 2013 be this fall? Boys Basketball Team Repeats As Division Champions! Girls Basketball Team Repeats As Division Champs! Swim Team makes splash this year with increased numbers! Student Government wraps up great year! Class of 2016 Senior Band Salute! Zombies and Bunnies and Swingsets, Oh My! Chanting, Cheering, Taunting: Where Do You Draw the Line? Should RHS Change to Gender Neutral Graduation Gowns? Where Has Bulldog Nation Gone? Should Boston Host 2024 Olympics? Should Mr. and Miss Rockland be chosen the same way? First Pep Rally of the Year Precedes Homecoming! First Pep Rally of the Year! Nick Cara and Madison Parlee holding a sign showing their Rockland support. Emily Hunt-Grandmont, Anthony DiNino, Jill Donahue, Ashley Murphy, Alex Anzivino, Madison Parlee and Brianna Peppino. SGC President Hannah Murphy and Vice President, Jill Donahue. Jamie Atkins and Jill Donahue admiring torch holder, RHS Special Olympian, Anthony DiNino. RHS Special Olympian Emily Hunt-Grandmont along with Marissa Smith, Brianna Peppino, and Alex Anzivino. Juniors Justin Sherlock and Francisco Oliveira managing the concessions stand. Torch holder, Anthony DiNino making his way to the stage. Anthony DiNino holds the torch high as Jamie Atkins and Jill Donahue look on. Alex Anzivino rolls a bocce ball as Marissa Smith gives encouragement. Anthony DiNino carries in the torch. Every year, the Massachusetts Special Olympics organization hosts an Unified Bocce Tournament. This past Sunday, Jan. 29, was the second consecutive year RHS has hosted this event. This year marks the 50th anniversary of the Special Olympics. At the event, 15 schools participated in the tourney and 15 others came to support and cheer on the Special Olympians. In total, the MASC and the Massachusetts Special Olympics organization sponsored event had 40, four person teams participating from all over Massachusetts. At the event hosted by our SGC president, Hannah Murphy, attendees could buy items from concessions, raffles, an Olympic village, and lunch which were all provided by Rockland Student Government. In the end, all proceeds went back to the Special Olympics. At the Opening Ceremony, RHS Special Olympian, Anthony DiNino carried in the torch and was accompanied by school resource officer, Ethan Schnabel. Here, Patti Doherty, the Massachusetts Director of Schools and youth engagement reminded students councils about the upcoming Polar Plunge. All proceeds will go to Special Olympics and the set goal is to raise over $50,000 at the event. After months of preparation, the RHS Mock Trial Club finally made its way to Brockton District Court to face off against Thayer Academy yesterday, Jan. 25. In this trial, RHS took the role of plaintiff. Acting as attorneys were senior, Harry Hunter, junior, Jasmin Morse, and first timers, sophomores, Molly Boggs and freshman, Annie Kelley. Witnesses were first timers, sophomores Hannah Wyllie, Maddie Gear, and junior, Kate Burke. In the end, RHS won the verdict of the case after great preparation and hard work with assistance from advisers, Greg Rowe and Randal Grimmett. It has been three years since Rockland’s National Honor Society has hosted an American Red Cross blood drive. This past Wednesday, Jan. 24 in the back gym, students and teachers lined up to donate their blood and red blood cells to patients in need at local hospitals. At the blood drive, the Red Cross collected 30 donations, these 30 pints of blood will be used to save up to 90 lives. Throughout the day, seven donors completed the Power Red Cell donation. Here, donors participated in apheresis which removes the plasma through separation of the cells and plasma. At the end of this process, the blood cells are reintroduced into the body and the plasma is then donated to patients being treated for autoimmune diseases. Another notable part of the day included 21 first-time donors throughout the Red Cross Blood Drive. 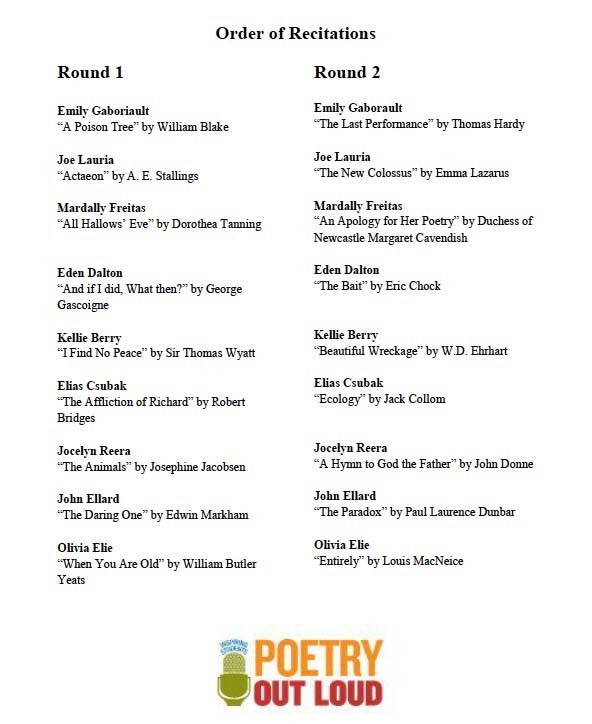 Every winter RHS competes in the Massachusetts Poetry Out Loud program that allows high school students to compete against each other in the art of poetical recitation. From this, placing students are rewarded with scholarship money. Students start off in the town level competition. From there, the first place student goes on to compete in the Southeast Regional competition, March 4, in South Yarmouth. Then, the top six from regionals go on to the state wide competition, which will take place March 11. The top placer from the state competition then meet their final destination, facing the top placer from each state in Washington D.C. where they will compete on the national level. 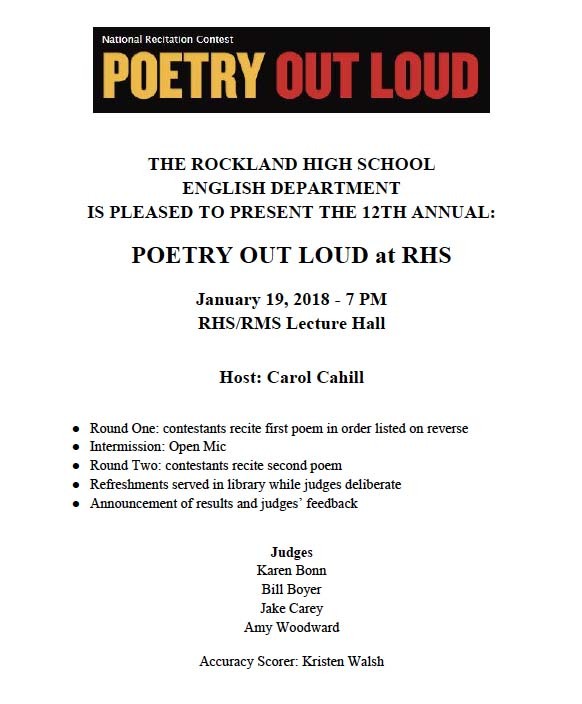 Here at RHS, the competition took place last Friday, Jan. 19, at 7 pm in the RMS/RHS Lecture Hall. The event was hosted by head of the English Department, Carol Cahill. Judging the competition were Karen Bonn, Jack Carey, Bill Boyer, and Amy Woodward. Judging the participant’s accuracy was RHS English teacher, Kristen Walsh. The eight students competing Friday night included: Kellie Berry, Eden Dalton, Olivia Elie, John Ellard, Mardally Freitas, Emily Gaboriault, Joe Lauria, and Jocelyn Reera. Out of these eight strong competitors, scholarships were awarded to the top three contestants. Coming in third place was senior Kellie Berry. Placing second was junior John Ellard, and moving on to the regional competition is senior Eden Dalton. Come watch your favorite Bulldogs battle for Poetry Out Loud supremacy! The winner will go on to Regional Competition next month!! Eighth Grade Open House: Total Success! RHS students in the cafeteria at booths to explain the clubs and activities here at RHS. A packed cafeteria filled with eighth graders and their parents learning more about RHS culture. As the thought of high school starts to dawn on the Class of 2022, RHS took the opportunity to hold an open house for the incoming eighth graders last night, Jan. 10. This year, RHS Principal, John Harrison decided to switch things up a bit at Open House with the introduction of a quick video to go over all the educational departments here at RHS. After a greeting by Athletic Director, Gary Graziano, Vice Principal, Kathy Paulding, RHS seniors Jill Donahue and Zachary Peterson, and a panel discussion held by students to talk about RHS culture, parents and eighth graders went to the cafeteria where they had the opportunity to learn more about the clubs and activities available here at the high school. In the cafeteria, RHS students came to be able to meet the eighth graders and discuss clubs and sports they are apart of to show them that there is something for everyone here at Rockland High School. Principal Harrison concluded that he was pleased overall with the turn-out, the student involvement, and the professionalism of the informative presentations. All in all, the Open House was a success. With a higher attendance than previous years and more student involvement, the eighth graders and their parents left the school last night feeling more informed about life here at RHS. 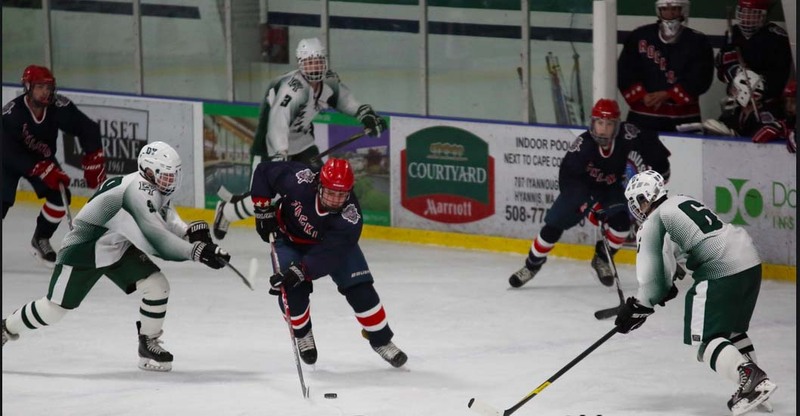 The RHS hockey team, coming off a Cashman Tournament championship on Jan. 1, added two more wins in the first week of the New Year, giving them a record of 7-1-1, including a 7-2 win Saturday, Jan. 6 against Cohasset. Below is our hockey team profile from the December issue of the Veritas. D-Y game photo by local photographer, Steve Gilbert (@stevegilbert4). 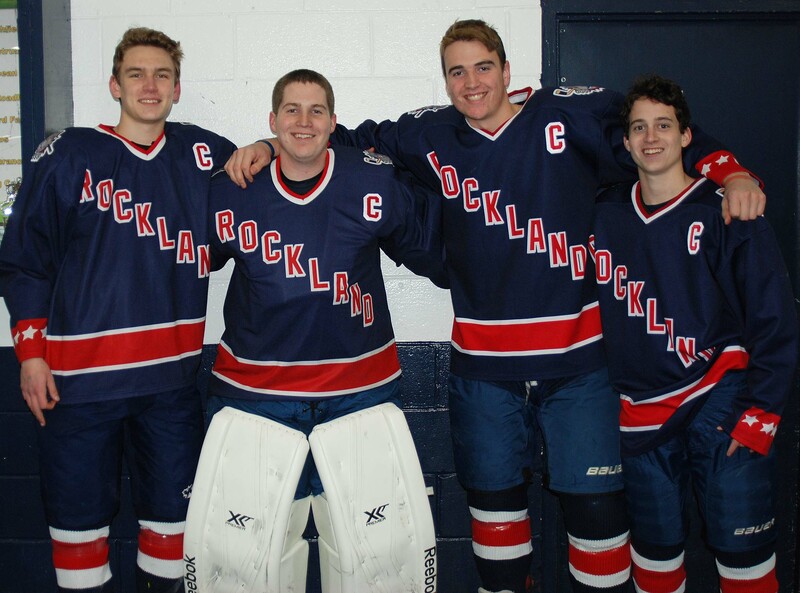 This year the Rockland hockey team hopes to carry its success from last year into this year. After winning their league and making a deep tournament run last year the Dogs hope to go even further and make it to the Garden this year. Coming off a season where they went an amazing 21-2-3, they will need to play fundamental hockey in order to continue their success this season. No one knows that better than Coach Mike Flaherty. This season the Dogs have already started and are at a 2-1 record with a big win against the Abington Green Wave in their season opener, a tough loss to Hanover, and a dominating 5-0 win over EB. These early successes and an early defeat will fuel the team as they have goals set for the season that are nothing short of difficult. “Our mindset is to repeat as league champs and be difficult to play against, and this year we have a real opportunity to make it to the Garden,” said Flaherty when asked about his goals for the season. The hockey team is very excited for an opportunity to repeat as league champs. This would make them the first hockey team in school history to repeat as league champs. With a few freshmen and sophomores providing meaningful minutes the Dogs are set up for a pretty successful team in the future. However, the juniors and seniors will play a huge part this year, and could be the determining factor if this team repeats or not. Coach Flaherty is confident about his returning players. “The guys coming back from last year are a big difference maker for us with their experience and hockey knowledge,” said Coach Flaherty. Four of the returning group include captains Matt and Harry O’Brien, Joe Campanile and Mike Flaherty. Coach Flaherty is very optimistic about this season and even though they were so successful last year he is not dwelling on the past. Coach Flaherty, who was inducted into the Rockland High School Athletic Hall of Fame recently, is fully concentrated on the future of the program. Need Something to Do Next Year? Join the Math Team! Don’t Miss 2019 Arts Festival! Monday, April 22 Baseball @ Norwell 4 pm PPD Tuesday; Girls Tennis vs. Norwell (Home) 4 pm PPD Tuesday. Tuesday, April 23 Softball vs. Norwell (Home) 4 pm; Boys Lacrosse vs. Middleboro (Home) 4 pm; Girls Lacrosse @ Middleboro 4 pm; Boys and Girls Track @ Norwell with Carver 4 pm. Thursday, April 25 Boys Tennis vs. Middleboro (Home) 4 pm; Baseball vs. Middleboro (Home) 4 pm; Girls Tennis @ Middleboro 4 pm; Softball @ Middleboro 4 pm; Boys and Girls Track @ Randolph 4 pm. Friday, April 26 Boys Lacrosse @ Cohasset 4 pm.